අද හවස විනාඩි 40 ආනාපාන සති භාවනාවේ නිරත වුනා. අනතුරුව මහා කස්සපත්ථේර බොජ්ඣංග සූත්‍රය සජ්ඣායනා කර, ඒ ඇසුරින් සාකච්ඡාවක් කළා. සහභාගී වූ සියලු දෙනාම ඉමහත් සතුටට පත් වුනා. තවදුරටත් අපගේ මගපෙන්වීම අවශ්‍ය බව ඒ අය කියා සිටියා. හැකි අයුරින් අවස්ථාව සලසා දෙන්නට සින්දි එකඟ වුනා. නැවත නැවතත් ආරාධනා ලැබෙන බවයි පෙනෙන්නේ. I could visit two schools and lead meditation sessions. 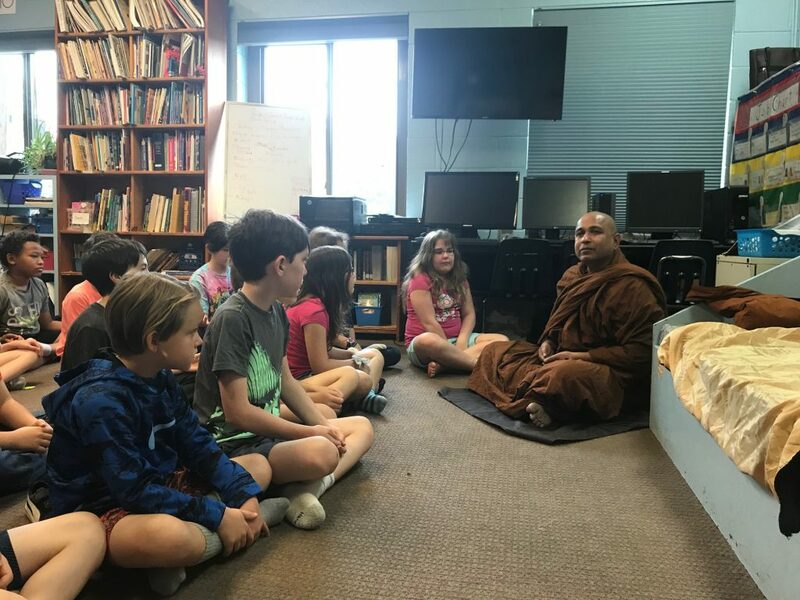 Those children were so much keen enough to attend Mindfulness of Breathing, Walking Meditation and the Practice of Loving Kindness. 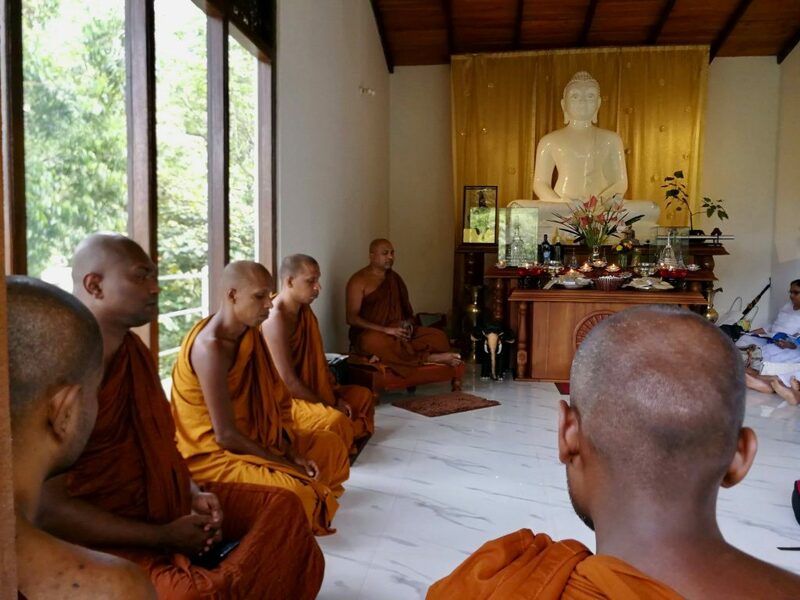 Yesterday evening, The Dhamma Discussion at the Maryland Buddhist Vihara was based on Sacca Vibhanga Sutta. It was not a detailed explanation. But devotees were very keen to follow what was shared. I am grateful to Nayaka Maha Thero. I pay gratitude to Suraj and his family too. 2018 මැයි මස 13 වැනි ඉරිදා බොහෝ දෙනාට ආශීර්වාද වනු පිණිස අටවිසි පිරිත 21 වරක් සජ්ඣායනා කර, මහා සංඝරත්නයට දානය දෙන්නට කටයුතු සංවිධානය කරනු ලැබීය. මෙහිදී විශේෂයෙන් විවහා වී අවුරුදු 50ක් ගතවීම නිමිත්තෙන් මලින්තාගේ අම්මාටයි – තාත්තාටයි ආශීර්වාද කරන්නත් අවස්ථාව උදාවිය. පින්කම අවසන් වූයේ පුදුමාකාර වර්ෂාවක් මධ්‍යයේම විය. ඕෂධ හා මා ගඟෙන් නාන්නට කැමැත්තෙන් සිටි නමුත් එය ව්‍යවර්ථ විය. 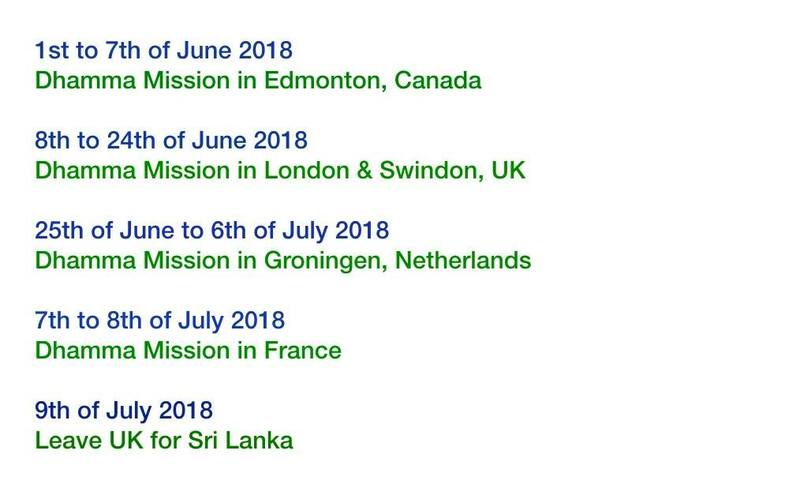 ලෝක ස්වභාවය සතුටින් භාරගෙන, ඉදිරියට යා යුතුම වන අතර සසර දුකින් නිදහස් විය යුතුම වේ.